Introduction As a market leader in executive search for continuous improvement and operational excellence talent, The Avery Point Group pioneered the use of Lean and Six Sigma methodologies in executive search and recruiting. Although “imitation is the sincerest form of flattery”, don’t be misled by other “me too” executive search firms who try to copy / imitate the essence or our Lean Sigma Search™ value stream approach to executive search. Our principals are Six Sigma Master Black Belt and Lean trained by globally recognized industry leading companies and have real-world, practical experience in their application. As subject matter experts in the recruiting of Lean, Six Sigma and operations talent, our firm has been featured in leading industry trade journals such as: Quality Progress, Quality Digest and IndustryWeek. Unlike other executive search firms we truly speak the language of our clients and candidates. Learn more about our firm’s partners and their Lean and Six Sigma experience here. Overview Search excellence starts with the sound foundation of a well-defined and consistent search methodology. 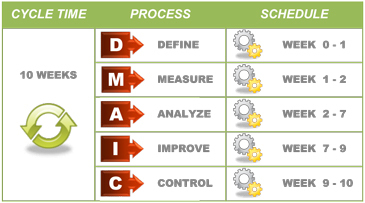 Our Lean Sigma Search™ value stream process methodology incorporates a unique Lean Six Sigma approach to filling our clients’ staffing needs. Traditional "Push Model" Recruiting vs. Our "Pull Model" Approach Most recruiting firms deploy a traditional “push model” approach to candidate recruiting and presentation, pushing as many candidates as possible through the recruiting process, in the “hope” that one might meet the client’s expectations. This is the very definition of process waste and is the antithesis of Lean and Six Sigma. 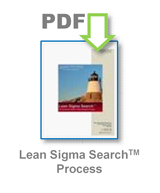 The Avery Point Group's Lean Sigma Search™ process is one built on a “pull model” approach to recruiting. Our executive search and recruiting process, instead, focuses on developing a keen understanding of our clients' critical to quality (CTQ) requirements by leveraging our Lean Sigma Search™ process approach and our deep Lean and Six Sigma industry experience to identify candidates that will better meet our clients' CTQ requirements. Candidates identified through our process are thus more likely to be “pulled” through the recruiting process by the client because they more clearly meet the client’s CTQ expectations. 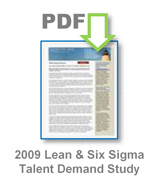 We invite you to learn more about our Lean Sigma Search™ value stream executive search and recruiting process on the following pages. 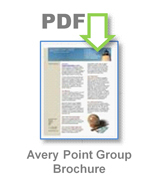 Overview The Avery Point Group is a global executive search and recruiting firm (Retained & Contingent Search Services) that assists companies in identifying, assessing and recruiting mid-level management to senior executive talent. Our firm leverages its principals’ decades of executive operations and staffing experience to provide the highest quality executive search services. Our firm provides functional expertise and executive search focus in the areas of Six Sigma, Lean, operational excellence, plant management, operations management, supply chain management, and finance. As executive recruiters our practice services a wide spectrum of industries, spanning manufacturing, distribution and service-based companies. Our Mission The Avery Point Group's mission is to assist our clients in defining their leadership needs, then find, and deliver those leaders essential to our clients’ success. Our priority is to provide superior service that exceeds our clients’ expectations and critical to quality (CTQ) requirements. We create executive search strategies based on a client’s individual critical to quality staffing needs. We leverage our Lean Sigma Search™ value stream process, our broad industry knowledge and our extensive database of contacts to find candidates who are uniquely qualified to fill our clients’ most critical mid-to senior-level leadership roles. Timothy Noble has over 20 years of executive leadership experience in manufacturing, supply chain management, distribution, and executive search. Throughout his career he has been consistently promoted and has held senior level executive roles in major Fortune 500 companies like General Electric (GE) and The Stanley Works (SWK). He also has extensive experience in Lean Manufacturing and is a GE trained Six Sigma Master Black Belt. Yvonne Hite has over 20 years of executive level leadership experience in manufacturing, financial services, Lean and Six Sigma. Throughout her career she has been consistently promoted and has held senior level executive roles in major Fortune 500 companies like General Electric (GE), Bank of America (BAC) and The Stanley Works (SWK). Ms. Hite is an ASQ Certified Quality Engineer, ASQ Certified Six Sigma Black Belt, and a Bank of America Certified Lean Six Sigma Master Black Belt with extensive experience driving Lean and Six Sigma initiatives on a global scale. See Yvonne's full bio here.